Krispy Kreme and Hershey's pair the flavor of the iconic Original Glazed Donut with the new Hershey's Gold candy bar to come up with the new Hershey's Gold Donut. 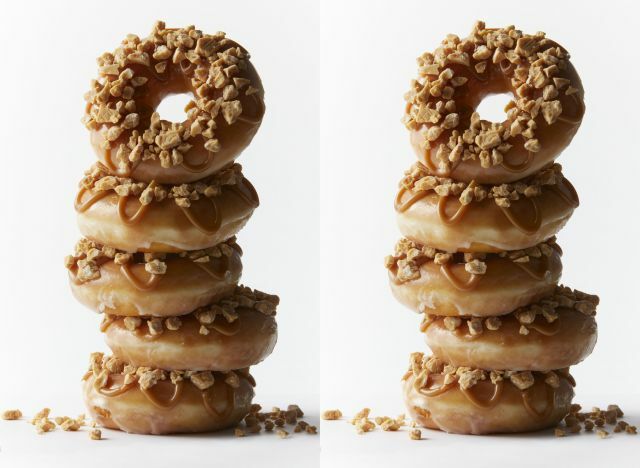 The new donut takes an Original Glazed Donut and tops it off with Hershey's Gold bar pieces and a drizzle of salted caramel icing. The recently introduced Hershey's Gold bar is a caramelized creme candy bar embedded with salty peanuts and bits of pretzel. Starting today, you can find the Hershey's Gold Donut for a limited time at participating US Krispy Kreme locations.